Candace: Hello. My name is Candace. I work with Dr. Edward Zimmerman at Las Vegas Laser and Lipo. We have our lovely client here today, with her permission to record the microneedling with PRP for some of her acne scars that she has here, some fine lines and wrinkles around the eyes, and some tone and texture that we're just looking to improve. We're going to go ahead and get started. We've already drawn the blood for the PRP, and that is ready to go. Her skin has been prepped and cleansed, and so now we're ready to go ahead and just start with the procedure. Candace: We're going to have you go ahead and turn this way. You're going to hear kind of loud buzzing noise, kind of like a tattoo, okay? Candace: All right. All right. We're using her PRP here as a gliding agent... It's a little cold... onto the skin. I'm starting at a 1.4 millimeter depth. Our goal is to reach pinpoint bleeding onto the skin. Once we achieve that, then that's kind of our clinical endpoint. If we're not reaching that, then we might want to go a little deeper, but she's starting to reach that pinpoint endpoint already. All skin types are different, depending on the person. Doing okay? Candace: Okay. We work in little sections at a time, obviously, as you can see, in a circular motion, repeating over the skin until that clinical endpoint has been reached. Doing okay? Candace: Then turn your head straight. There you go. You're doing great. How does it feel? Candace: Not bad? No pain? Candace: Good. Okay. When going to the forehead, since this skin is a lot thinner here, we're going to actually lower the millimeter depth. We're going to go from a 1.4 to a 0.8, and we'll see how she tolerates that. Here we go. Doing okay? Candace: The forehead's usually a little more sensitive, so if it's too much, let me know, okay? Candace: You're doing great. Almost done. A little more. I'm going to go across the upper lip, and we're going to stick with the same millimeter depth because the upper lip tends to be more sensitive. So for the comfort level of the client, we don't go too aggressive or too deep here. You want to take it right along the vermilion border. Helps with those little fine lines. Doing okay? Candace:Okay. We're going to start working closer towards the eye area here. Next, you're going to take gauze and pull down on the skin here so you can get real close to the eye to help those little fine lines and wrinkles, crow's feet. Great job. Now we've got the nose left. The nose can be sometimes really ticklish, okay? Candace: I'm still sticking with the same millimeter depth because the nose tends to bleed a lot, so we're going to be a little more conservative. Doing okay? Candace: Tickle from the vibration? Now I'm just going back over some of the areas where the acne scars are, just giving them another couple passes. Okay. I'm going to turn that off. Doing okay? Candace: Good. What I do with my clients now is I take the extra PRP that's leftover, because we don't want to waste any of it, and I literally just massage it into their skin. Okay. Now, before we start to cleanse her, I am going to change gloves, get a fresh, clean pair on. All right. Okay, cool cleanser. Candace: Okay. Now we are going to put on some Regenica Repair Complex cream to help just soothe the skin, because right now the client's experiencing some inflammation. The skin is going to be sensitive, a little stingy to any products that you might be putting on, so we stick with the Regenica because it doesn't burn or irritate the client's skin immediately following a procedure like this. Candace: Next, put on a little bit of moisturizer with an SPF in it to protect the client's skin. Candace: Okay. All right. She is all done. 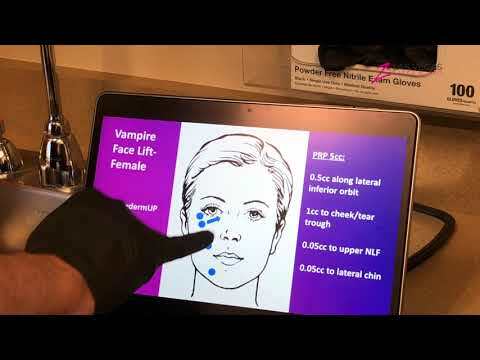 Thank you for watching our video, and hope you come see us at Las Vegas Laser and Lipo.